(Release Date: August 5, 2014)  The arrival of another animated adaptation of Edgar Rice Burroughs' 1912 novel "Tarzan of the Apes" sounds extraneous. Already turned into a superior Disney feature fifteen years earlier, the tried-and-true story is once again largely adhered to, albeit with a surge of sci-fi inspiration that crosses unashamedly into "Avatar" territory. When a plane crash takes the lives of his parents, explorer father John Greystoke (Mark Deklin) and mother Alice (Jaime Ray Newman), 4-year-old J.J. (Craig Garner) is left stranded alone in the remote jungle. Raised by protective ape mother Kala, who has just lost her own infant, J.J. grows into the vine-swinging, loincloth-wearing Tarzan (Kellan Lutz). When William Clayton (Trevor St. John), new CEO of the late John's Greystoke Energies, detects an emergency beacon from the helicopter's crash site, he sees it as his chance to finally capitalize on the yet-undiscovered places and living creatures hailing from the depth of the planet's history. When these seamy intentions threaten Tarzan's home, he and human conservationist Jane Porter (Spencer Locke) team up to stop Clayton and his army of armed mercenaries. "Tarzan" opens 70 million years ago as a meteor falls to Earth and wipes out the dinosaur population. Moving ahead to the 21st century, the film introduces the ill-fated John Greystoke and his family as they search for the ancient meteor, its legendary source of power a possible solution to the world's mounting energy crisis. When Tarzan loses his parents and is raised among the primates of the jungle, the film proceeds to hit all of the touchstones of Burroughs' original narrative without fully conveying the levity of Tarzan's situation or the joy of his freedom. As far as Tarzans go, this one something of a blank slate, lacking personality or the dramatic depth of a man whose feral life has been born from tragedy. His relationship with the courageous, free-thinking Jane is merely adequate, the two of them not sharing the growing bond one expects from them. If his treatment of the characters is nothing special, director Reinhard Klooss has spearheaded an overall world of scope and wonder, the exotic locales given a fantastical shade of whimsy. Drinking in the visuals might be enough for some, but the movie falters when it comes to its humans (it doesn't help that the stop-motion and computer animation is notably less sophisticated when it comes to the people than that of the animals and locations). There is much to admire in "Tarzan," but no lingering emotional through-line to this particular telling. At the risk of sounding as hacky as the back of a DVD box from a 1990s Miramax release, "Tarzan" swings onto Blu-ray with an effervescent high-definition 1080p digital transfer! While not every shot of the computer animation survives close scrutiny--the human characters lack the physical detail and emotion of the animals and lush landscapes around themthese inefficiencies are due solely to the animation itself and not symptomatic of an issue with the disc's picture quality. Truth be told, there are no overt troubles spots at all with the transfer, free of any clear signs of banding, damage or edge enhancement. Colors are bold, blacks are deep and dark, and the immaculate 2D depth makes yet another case for why brightness-dulling 3D just isn't necessary. The 5.1. DTS-HD Master Audio makes active use of its surrounding channels and really pulls the viewer into the goings-on. What isn't so great is the mix level of the track; when the music score is pounding away, it occasionally tends to overpower the film's voice-over segments, the dialogue proving difficult to decipher. This doesn't happen often, but it's enough to drop the sound rating down a grade level. Lionsgate's Blu-ray release of "Tarzan" is a sight to behold, its aesthetic grandeur so splendid it is mildly disappointing that the film couldn't have been more successful as a whole. Credit director Reinhard Klooss for trying something a little different with Edgar Rice Burroughs' original story and reimagining it with a modern sci-fi angle, even if the familiar characters do not quite spark to life as they did in, for example, Disney's animated 1999 version of the classic tale. 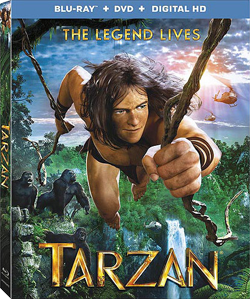 With a few cool featurettes delving into the motion-capture process and a top-notch digital transfer, this latest "Tarzan" ultimately comes off pretty well in its Blu-ray incarnation. Recommended, but maybe as a rental or when the sale price is right.